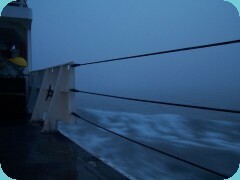 The NOAA ship Ronald H. Brown left Woods Hole, Massachusetts in the evening on July 17. We're on our way to the Lost City hydrothermal field. We'll be posting detailed updates starting on July 23rd. In the meantime, check out the latest photos.